What is driving the rapid spread of the ultra violet MS-13 gang in the big cities and small towns across the United States? Starting as a Los Angeles street gang in the 1980s, MS-13 is now terrorizing the United States and Central America, and rapidly metastasizing into a massive criminal enterprise. MS-13 or Mara Salvatrucha, is a super-violent criminal franchise set to rival the Mafia in its scope and deeds. With a reported 100,000 members ranging from Los Angeles to El Salvador, many consider it to be the most dangerous gang on Earth. The MS-13 gang has cliques, or factions, located throughout the United States With cliques in Washington DC, Oregon, Alaska, Arkansas, Texas, Nevada, Utah, Oklahoma, Illinois, Michigan, New York, Maryland, Virginia, Georgia, Florida, Canada, El Salvador, Guatemala, Mexico, and several other South American countries, the MS-13 gang is truly “international” and on the verge of becoming the first gang to be categorized as an “organized crime” entity. The Gang members sport numerous tattoos on their bodies and faces, wear blue and white colors taken from the El Salvadoran flag. 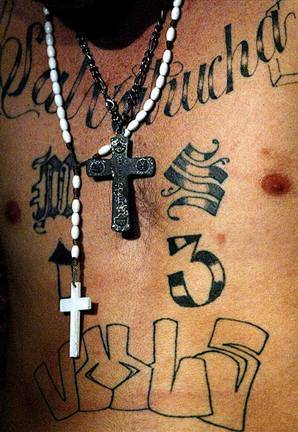 The MS-13 tell-tale body markings will typically include numerous body and facial tattoos containing the texts “MS”, “13”, or “18”. Various symbols are used including dice, crossbones, or daggers. Often the symbols signify the members area of specialization. For instance, if a member has a tattoo of a grenade on his back it means that particular person specializes in explosives. The gang shows no mercy, they literally chop victims in front of their families and murder people in cold blood. The gang has spread its wings internationally and the members are more mobile in their technology with cell-phones and Internet as compare to the Mafia. There is no concrete evidence that the gang has spread to Asia. However, there are some members active in Europe, parts of Spain and Latin America. The street gang has provoked an unprecedented multi-agency, multi-national task force throughout Central America, and parts of Europe trained in combat. People try to replicate and duplicate the gang’s image and lifestyle, especially the younger generation. Professing to be part of MS means you are accountable to uphold MS Style activity and if you don’t, you will suffer the consequences. One of the reasons for MS-13’s success is their flexibility. When they enter a new area where they are not known, they will wear their colors in a flashy display in order to promote intimidation. Once the authorities catch wind of their presence, they will change their colors, carry their bandanas in their pocket, and change their markings to say, 76 or 67 (which total up to 13). Flexible, organized, and highly violent – Mara Salvatrucha 13 has carved a niche in our society and dug in their heels, refusing to back down even from high profile authorities such as the Federal Police. This entry was posted on Friday, November 10th, 2006 at 2:07 pm	and is filed under Interesting Stuff. You can leave a response, or trackback from your own site. 6 Responses to "MS – 13"
The MS-13 didn’t form out of vacuum. It had it’s roots in the catastrophic US foreign policies failures in El Salvador. During the eighties and early nineties, EL Salavador experienced a horrific civil war that was claimed over 75,000 lives. US involvement in El Salvador helped turned many El Salvadoreans into refugees. Many of them settled in places like Los Angeles were they faced a hostile reception in the neighborhoods they moved in creating an opportunity for a group like the MS-13 to form and thrive. The MS-13 made very efficient use of that opportunity and I can’t blame them. I think a lot of media stuff about the MS-13 is hysterical; and it clouds the reality that the US government never takes responsibilities for it’s foreign policy failures, and then they have the nerve to blame MS-13? in the very first line of your post you meant ultra violent not ultra violet which is a light wave slightly shorter than the color purple. proof read dude, cant read past the first line and take anything you write seriously. La Mara Salvatrucha is now in ASIA-Pacific Region. MS 13 is now in the Philippines, Malaysia, Singapore, Thailand, Indonesia and Hongkong. Among the MS 13 cliques in Asia, The Filipinos in the Philippines the deadliest, because they will kill mediamen, politician and witnesses on SITE!! !